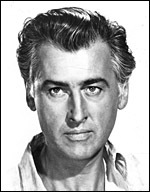 Although active in British cinema since 1933, Stewart Granger shot to stardom after appearing in a supporting role in the Gainsborough costume melodrama The Man in Grey (d. Leslie Arliss, 1943). He had changed his real name (James Stewart) for obvious professional reasons and successfully appeared in popular Gainsborough productions such as Fanny By Gaslight (d. Anthony Asquith, 1944), Love Story (d. Leslie Arliss, 1944), Madonna of the Seven Moons (d. Arthur Crabtree, 1944) and The Magic Bow (d. Bernard Knowles, 1946), with contemporary stars such as Margaret Lockwood , Phyllis Calvert , James Mason and Patricia Roc . Demobilized from wartime service for health reasons, Granger 's handsome looks, athletic physique, and masculine profile made him one of 1940s British cinema's key romantic leading men and brought him to the attention of Hollywood and an MGM contract which lasted until 1960, and which in turn brought him international stardom in such capers as Scaramouche (US, d. George Sidney, 1952). He was married first to actress Elspeth March and second to Jean Simmons , with whom he co-starred in the romantic comedy, Adam and Evelyne (d. Harold French, 1949), the historical romance, Young Bess (US, d. George Sidney, 1953), and the underrated 'Victorian' thriller, Footsteps in the Fog (d. Arthur Lubin, 1955). Despite frequent typecasting, Granger could often produce interesting performances such as his 'spiv' role in Waterloo Road (d. Sidney Gilliat, 1945) and the doomed romantic leads in Blanche Fury (d. Marc Allégret, 1947) and Saraband for Dead Lovers (d. Basil Dearden, 1948), who were victims of a ruthless class structure. After freelancing in Europe during the 1960s and 1970s he began to appear frequently on TV, one of his last roles being as Prince Philip in The Royal Romance of Charles and Diana (tx. 20/9/1982). Autobiography: Sparks Fly Upwards (1981).